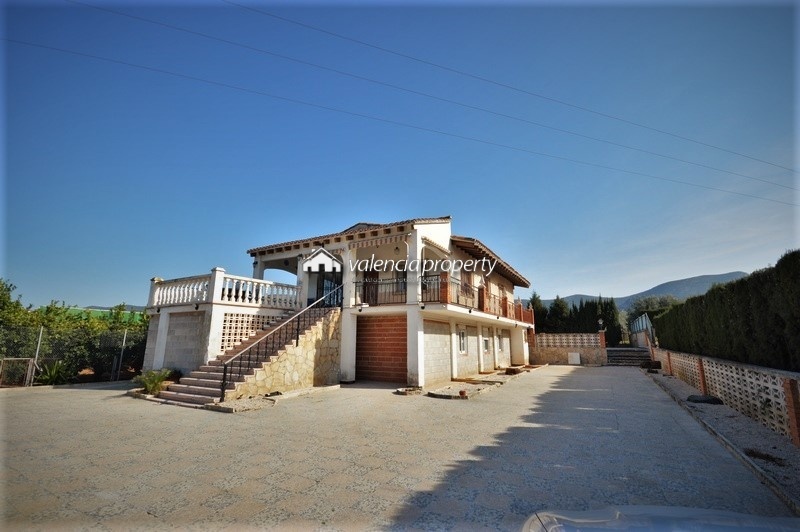 Villa in Xativa, 4 bedrooms, 2 bathrooms, and pool. 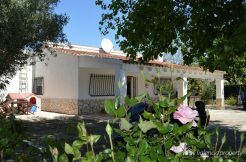 The property is located northwest of the Bixquert Valley, in Xàtiva. A city well communicated by road and train with the main capitals of Spain and offering all kinds of services to its residents. Heir to a rich history preserves a great artistic and cultural heritage. It has very close the airports of Valencia and Alicante, to 78 and 112 km, respectively. From the city center to the property boundaries there are 5 km. The whole route is paved so it is really fast and comfortable to arrive. Once in the entrance gate, we enter a semi-circular path that helps us to save the small distance to the house through a pine forest. It is easy to realize that the convex angle that forms the road, prevents being able to see from the entrance to the interior of the enclosure. From there it generates a high sense of privacy. The second sensation that is perceived immediately, is that of being in the middle of nature, although in reality we are in an urbanization and classified urban land. 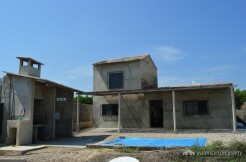 The plot has 4378 m², a sufficient area, to distribute all the surface, according to the specific needs of each one. In one area there is the poo (9×4)l, facing east, taking advantage of an elevation of the land, with sun from sunrise to sunset. To the west of the plot, at the back of the house, there is a small orchard with some fruit trees (orange, lemon, fig). The porch area is oriented to the South, to be the warmest in Winter. In this same space, facing the porch, there is a pine tree that gives a pleasant shade in summer. Next to the pool, in the garden there is a barbecue. The property has 174 m² built, of which 137 m² correspond to the interior surface of the house. The building, dates from 1978, and is built on a single floor but above ground level, with the entire foundation being ventilated through openings around the rectangle that forms the base of the house. This avoids the risk of humidity inside the house. The porch offers stunning views, and the ideal temperature at all times of the year, but what is very practical is to be able to descend indistinctly to the rear area of the house or to the main facade, by means of independent stairs. The entrance to the house is made from this spectacular porch that is on the south facade and goes directly into the living room. While it is true that there is a service door that allows access to the kitchen independently. Once we go inside the room, the sensation is of maximum amplitude (not in vain the dimensions of this room reach almost 30 m²) and enjoy a good light in large part due to the large windows, first, and the South orientation, which allows to pierce the sunlight, practically throughout the day, in second place. The kitchen, with independent entrance from the outside, has another entrance from the interior corridor of the house. In total 15 m², which makes it suitable for use as a kitchen / dining room. It has a quite wide and deep pantry with a storage capacity more than considerable. Of the 4 bedrooms it has, all but one have dimensions over 10 m² and all have a built-in wardrobe. That is, we can consider 3 double rooms and one single. The master bedroom has a bathroom en suite and there is a second family bathroom, both equipped with electric water heaters and towel dryers, also electric. A property that we put within reach of any budget. Although it is true that it needs some update in some aspect, we are sure that it can perfectly fulfill as a house to reside all year, or as a holiday home. Its privileged location and its surroundings can make it one of our favorites, without a doubt.